What is the shelf life of 3Mâ¢ Cartridges? Provided they are stored unopened in the original packaging, cartridges will last five years from manufacture date. How should I store my 3Mâ¢ Respirator Cartridges and Filters? When not in use, your 3Mâ¢ Respirator, Cartridges and Filters should be kept clean and dry, away from contaminated atmospheres to avoid deterioration. A storage container or bag that can be sealed can be utilized for this purpose. Why do I need to use a 3Mâ¢ Particulate Filter with my 3Mâ¢ Gas & Vapor Cartridges for some applications? The particulate filter removes the tiny droplets or particles in the air (e.g., mists from spray painting). The gas and vapor cartridges do not filter these particles. If no particulate filter is used, they could be breathed in. Because everyoneâs face is different, a fit test is used to determine an adequate match between the faceseal of a respirator and the face of the wearer. Ideally this should be done before the respirator is first issued and then at least annually. Can I wear a respirator with a beard? 3M recommends respirator wearers are clean-shaven. Do not use respirator with beards or other facial hair or other conditions that prevent a good seal between the face and the faceseal of the respirator. What is the definition of Cartridge Change Schedule? Change schedule is a specified time period after which the chemical cartridge will be replaced. This time period may be established after consideration of the service life estimate, workplace conditions such as contaminant concentration, relative humidity, temperature, work activities, respirator use pattern (e.g., continuous or intermittent use), presence of other materials, potential for contaminant migration/desorption, health effects of the gas or vapor, and quality of warning properties, if any. What is the definition of Service Life? Service life is the measured or estimated period of time before breakthrough of a contaminant (gas or vapor) for a specific chemical cartridge under specified conditions of the test or estimate. Why can't I use warning properties to determine chemical cartridge change-out? When OSHA revised 1910.134, it changed the standard requiring that change-out schedules be determined using objective data. In the past, warning properties such as odor, eye irritation, and respiratory irritation were relied on almost completely for indicating when chemical cartridge breakthrough was starting. In fact, organic vapor chemical cartridges were only approved by NIOSH for those organic vapors with good warning properties. However, warning properties rely upon human senses that are not foolproof. The 1987 NIOSH Respirator Decision Logic described the typical wide variation of odor threshold in the general population (greater than two orders of magnitude). Other problems exist: shift in odor threshold due to extended low exposures, shifts due to simple colds and other illnesses, and failure to recognize odor because of distraction of the workplace competing for worker attention. Given the variability among people with respect to detection of odors and differences in measuring odor thresholds, a better practice is to establish cartridge change-out schedules even for chemicals with âadequate warning propertiesâ. Because of this fact, when OSHA revised its respiratory protection standard, it prohibited the reliance on warning properties as the primary means for indicating when it was time to change the chemical cartridges. Instead, OSHA requires that a change schedule be established that identifies how long a chemical cartridge can be used in a particular workplace before being replaced. OSHA has indicated that if an effective change-out schedule can be established for chemicals with poor warning properties, chemical cartridges could be used for these chemicals as well. In work sites of every variety, edges are much more common than people realize â and they pose a greater risk than youâd expect. Without protection designed for edges, traditional lifelines risk being severed. Designed for performance in sharp and smooth edge applications, the TurboLite Edge offers versatility, enhanced user mobility and maximum safety. The TurboLite Edge ensures workers are safe in applications requiring foot-level tie-off or working near edges. We are proud to now offer Tingley rubber footwear, clothing and accessories.Â Â Tingley offers the broadest selection of injection molded over-the-shoe footwear in the industry.Â Their line offers options of materials and styles to meet a wide range of protection and application requirements.Â They offer injection molded overshoes in Natural Rubber and PVC (Polyvinyl Chloride).Â They complement this offering with both steel toe safety and slip resistant ice traction overshoe products. Their overshoe products allow users to wear their normal work shoes, while having protection against the environment. Overshoes are the perfect choice when the protective requirements are intermittent or weather driven. Material Selection: Before choosing a material where contact with a given chemical may occur, the users should perform their own tests. If highly toxic chemicals are present, special care must be taken into consideration when choosing the correct protective product. This care should include daily inspections to ensure that normal wear and tear have not reduced the integrity of the product. Depending on the toxicity level of the chemical, products should be disposed of if intimate contact with the chemical has occurred. PVC (Polyvinyl Chloride): Is a synthetic thermoplastic polymer that provides good protection against animal fats, many acids, alcohols, alkalies, bases, oils, and petroleum hydrocarbons. PVC is not recommended for use in ketones, aldehydes, and many solvents. Our FrigiflexÂ® formula, used in our Workbrutes overshoe line, has good stretch and low temperature properties to stay supple in cold weather. 1. Seamless construction for 100% waterproof protection. 2. More material in heel, toe, and sole for longer wear. 3. Less material in the upper results in lighter weight for improved flexibility and less leg fatigue. 4. Sturdy molded button on boot styles for secure closure. No hardware to corrode, conduct, tear, or snag. 5. Full opening gusset on boot styles for easy on and off. 6. Heavy duty heel kick for easy off. 7. No lining. Completely washable. Wipes dry quickly. 8. Deep cleated outsole spits out debris for good slip resistance and longer wear. ANSI is referenced as the originator of first aid kit specifications and minimum contents requirements (see ANSI requirements in more detail below). 16Â Â Â Adhesive Bandages, 1" x 3"
1Â Â Â Adhesive Tape, 2.5 yd. 1Â Â Â Burn Dressing, 4" x 4"
1Â Â Â Cold Pack, 4" x 5"
1Â Â Â Eye Wash, 1 oz. 1Â Â Â Roller Bandage, 2" x 4 yd. 2Â Â Â Sterile Pads, 3" x 3"
2Â Â Â Trauma Pads, 5" x 9"
1Â Â Â Triangular Bandage, 40" x 40" x 56"
50Â Â Â Adhesive Bandages, 1" x 3"
2Â Â Â Adhesive Tape, 2.5 yd. 2Â Â Â Burn Dressing, 4" x 4"
2Â Â Â Cold Pack, 4" x 5"
1Â Â Â Eye Wash, 4 oz. 2Â Â Â Roller Bandage, 2" x 4 yd. 1Â Â Â Roller Bandage, 4" x 4 yd. 1Â Â Â Padded Splint, 4" x 24"
4Â Â Â Sterile Pads, 3" x 3"
1Â Â Â Tourniquet, 1"
4Â Â Â Trauma Pads, 5" x 9"
2Â Â Â Triangular Bandage, 40" x 40" x 56"
The KAMORIâ¢ RWG50 Cut Protection Work Glove by Radians has an ANSI Cut rating of A4 and an EN388 cut rating of 5. The white grain goat skin glove with an Aramid lining provides excellent cut protection. The dense TPR overlays on the back of the hand provide added impact protection. Slip-on cuff design provides a comfortable fit. Tested to EN 388 standards for Abrasion Resistance, Blade Cut, Tear, and Puncture (3 5 2 3). 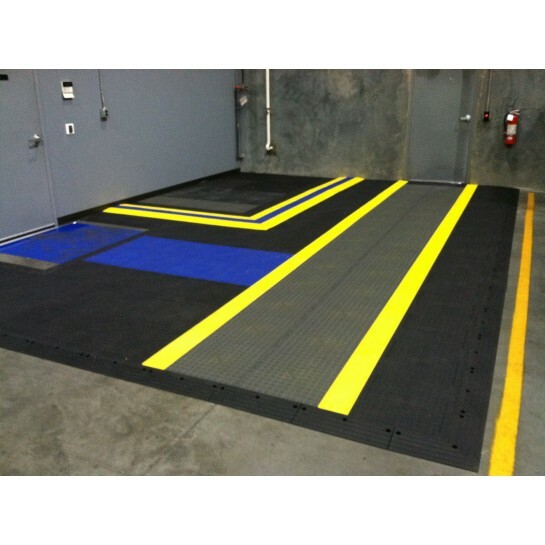 ErgoDeck with patented LockSafe technology is perfect for manufacturers seeking a modular, heavy-duty surface that can be unlocked and reconnected multiple times. Available in solid and drainage configurations, ErgoDeck has the versatility to play any position on the field. 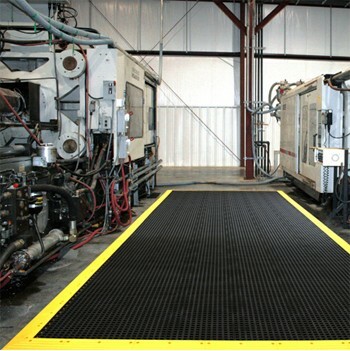 Looking for even greater protection against slips and falls? Our optional GRITSHIELD and No-Slip Cleats ensure your team stays sure-footed in even the most challenging environments. WHICH ERGODECK IS RIGHT FOR YOU? Ideal for heavy cart and foot traffic. HDâs harder compound allows carts to roll with ease, while the box-spring design provides the structural support necessary for heavy loads, as well as impact absorption for health and comfort. Ideal for areas with primary foot traffic and light cart traffic. GP uses the same box spring pattern as HD, but features a softer compound for greater comfort and reduced heel strike. 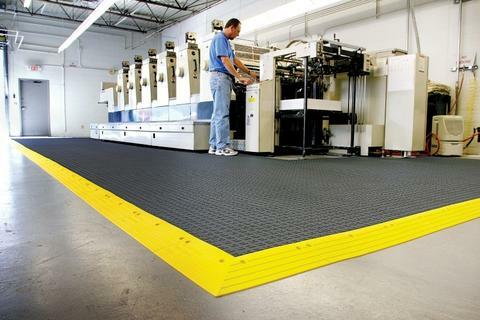 The MVP of flooring shows a softer side with ErgoDeck Comfort. 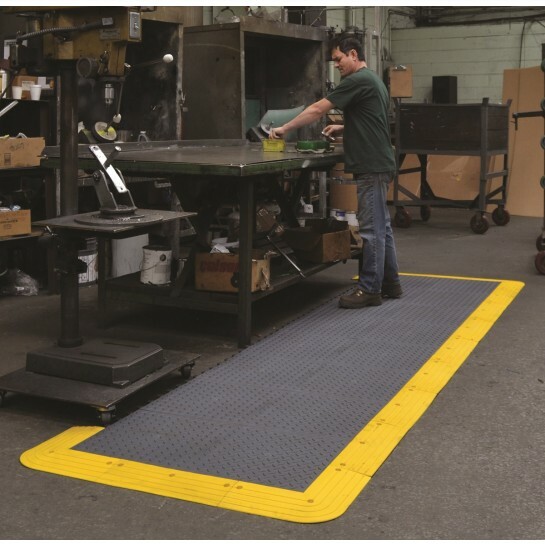 This spring-only design offers more compression underfoot for a rubberlike feel, but with the secure connections and customization that only ErgoDeck can deliver. ABOUT ELASCO PRODUCTS, LLC: Based in Huntington Beach, California, Elasco Products, LLC manufactures high quality solid cast polyurethane cable protectors and cable dropovers that are both tough and durable. Made in the USA and backed by a lifetime warranty, Elasco’s protectors set the industry standard. Over the past three decades, Elasco has provided their products to numerous industries including: Utility, Entertainment, Military, Mining, Oil & Gas, Transportation, Traffic Safety, Special Events, and many more. 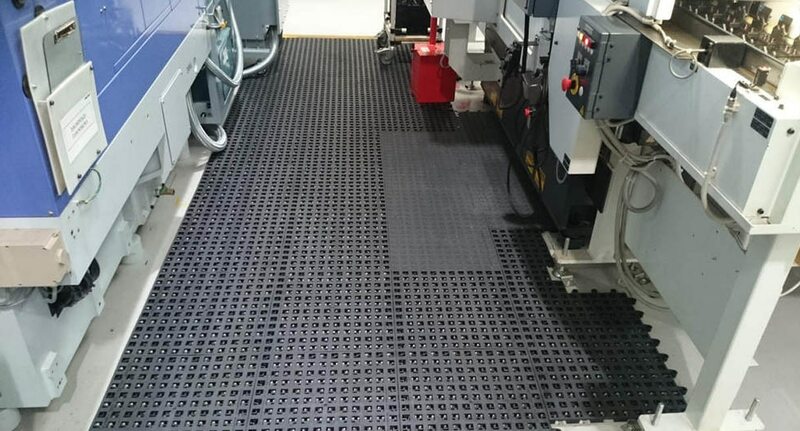 In addition to a complete line of lineal pieces, Elasco’s products includes many turns, intersections and end boots to allow infinite configurability for short term cable protection and organization needs as well as the durability to withstand environmental demands for longer term setups. Elasco Products only designs and manufactures their products using the highest quality of materials and equipment. All products are manufactured using polyurethane materials and through an open cast molding system. Our materials are 100% non-hazardous including mercury free, and all made in the USA. Injection molded polymers do not offer the superior physical properties of open-cast thermoset polyurethane. This hot cast process provides a long slow cure and post cure that enhances the cross-linking of the polyurethane molecule. Compared to Rubber: Polyurethane is not biodegradable like rubber so will not rot and degrade over time like rubber. It can withstand the natural elements, such as the sun, much better, and has superior tolerance to greases, oils, and other chemical substances. Pigment hardness in color can also be easily adjusted with polyurethanes. Compared to Plastic: Plastics are much more likely to crack and break under high impact pressure. Not only is polyurethane stronger in load bearing and high impact situations, but it is also retains its elasticity and strength much better. Compared to Metal: Polyurethane weights less, is easier to handle, generates far less noise, stronger abrasion and corrosion resistance, and typically outlasts and outperforms metal; often lasting three times longer. Please read information below from the United States Consumer Product Safety Commission. Please note, Kidde is handling ALL exchanges of recalled product directly, please visit their website to request an exchange, link: https://inmarmarketaction.com/kidde/Kidde284US/. Sold At: Department, home and hardware stores nationwide, and online for between $12 and $50 and for about $200 for model XL 5MR. These fire extinguishers were also sold with commercial trucks, recreational vehicles, personal watercraft and boats. Importer(s): Walter Kidde Portable Equipment Company Inc., of Mebane, N.C.
Will a Facemask or Dust Mask Protect Me From Smoke? What is the health threat from wildfires and smoke? Smoke from wildfires is a mixture of gases and fine particles from burning trees and other plant materials. Many more chemicals can be released when wildfires reach man-made items or structures. Smoke can irritate both your eyes and respiratory system and worsen chronic heart and lung diseases. If a facemask, surgical mask or dust mask will not protect me from smoke, what should I wear? Air purifying respirators (APR) are certified by NIOSH and classified as either an N, R, or P product with an efficiency of 95, 99 or 100% against these very fine particles. Air purifying respirators such as an N95 respirator or a P100 filter on a reusable facepiece will remove the fine particulate found in wildland fire smoke. However, they will not filter gases such as carbon monoxide. They also do not supply oxygen and will not protect against super-heated gases, a concern for workers who are fighting fires. It is important to note that for tight-fitting respirators to be effective, the user must be clean-shaven in the area where the respirator contacts the face. Examples of APR’s that may help reduce exposures to smoke include: 8210, 8210V, 8511, 8214, 9210+, 9211+ These types of respirators will also remove particulate: 6100, 6200, 6300, 6501, 6502, 6503, 7501, 7502, 7503 facepieces with 2091, 2097, 2291 or 2297 filters. How long will a disposable respirator last? It is difficult to predict how long the respirator will last because the airborne concentration of particulate is unknown. However, when it becomes difficult to breathe through it, the respirator should be changed. If a disposable respirator is physically damaged (cut, strap broken, burn hole), it must be replaced immediately. Quick tips regarding respiratory protection based on the OSHA silica regulation revision. OSHA has issued a final rule (March 2016, OSHA Respirable Crystalline Silica in Construction Regulation – 29 CFR 1926.1153) for America’s workers, limiting their exposure to respirable crystalline silica, a substance OSHA has stated can increase the risk of developing silicosis, lung cancer and kidney disease. 3M has the expertise, resources and PPE to help you as you work to meet the new exposure limit and help protect your crew.